What is included in the Gibi master kit box? The Gibi master kit includes everything you need to get started. It includes a Gibi GPS tracker, collar/harness attachment clip, charging cradle, USB cable, A/C adapter, and quick user guide. See un-boxing video below. Each Gibi tracker has a specific device ID. This specific device ID is needed to create your Gibi account and subscribe for service. Operation and use requires subscribing to Gibi’s subscription service plan. How do I register my Gibi and create an account? How do I activate the device? When you create your Gibi account, the Gibi device gets activated. If you have already placed your Gibi device in the charger to charge, wait for the fully charged alert. If you have not placed your Gibi device in the charger to charge, please charge the device by sliding it into the charger and wait for the fully charged alert. If your Gibi device has not yet synced while charging, please see below on how to orient and sync the device with the GPS satellites. Also see FAQ on devices for information on the button light. How do I orient and sync my device to GPS satellites? Your Gibi device has synced with the GPS satellites when you see a paw print on the map. Getting the first GPS location may take time, sometimes up to 20 minutes. Once your device is fully charged, slide it out of the charger. Take it outside to clear line of sight of the sky. Wait until you see a paw print appears on the map. To speed up the process, change the location Check-In rate to every 1 minute. Please remember to change the Check-In rate back to 15 minutes or higher as battery life is reduced at faster Check-In rates. If you don’t see a paw print after 20 minutes, please try rebooting the Gibi. For more info, please see FAQ on Device and Battery. How do I activate (add) another Gibi device to my account? Go to ACCOUNT > My Devices. Click Add A New Device. Fill in the information requested. Remember to assign the device to a pet. How do I center the map on my dogs location? When using the Gibi mobile app, the map will center when you log into your account. When using the web app accessed at login.getgibi.com, center the map on you dog’s current location by zooming into the street level desired (anywhere on the map), then click on the image of your dog (default image is dog silhouette). See below on how to change the default image (dog silhouette) to image of your dog. How do I change the dog silhouette to image of my dog? Log into your account using a computer or tablet, go to ACCOUNT > My Pets. Click Edit Pet. Click Change Photo. Select photo from your folders. Click Save. How do I add another pet to my account? Go to ACCOUNT > My Pets. Click Add A New Pet. Fill in the information requested. Remember to assign your pet a device. Is the user manual online? Click here to see the quick start guide included in the box. ©2018 Gibi Technologies Inc. All Rights Reserved. 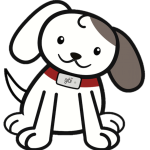 Gibi logo and Gibi Puppy logo contained herein are trademarks of Gibi Technologies Inc.